John Pollock & Wai Ting review WWE WrestleMania 35 from the MetLife Stadium in East Rutherford, New Jersey. 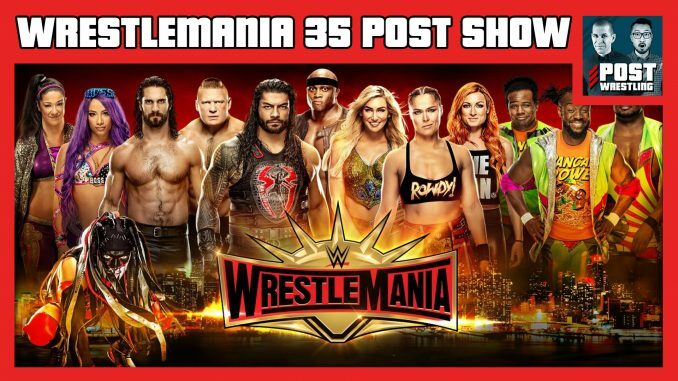 We discuss our live experience attending the longest show in WWE history featuring Becky Lynch defeating Ronda Rousey and Charlotte Flair in the first women’s WrestleMania main event, Kofi Kingston defeats Daniel Bryan in one of the best moments in WrestleMania history, Seth Rollins defeats Brock Lesnar in the show opener, and much more. Plus, we discuss our reactions to this morning’s POST Wrestling Live in NY Q&A, problems getting to and leaving MetLife Stadium, and your feedback from the POST Wrestling Forum. Double Double, Iced Capp & Espresso patrons can watch a special behind-the-scenes video of this recording from our NYC hotel room. Watch the archived recording here. This podcast is sponsored by Grappl, the new wrestling rating app available for free on Google Play and App Store.